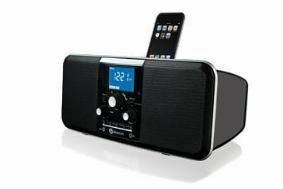 Boston Acoustics unveils £199 Duo-i Plus Dock | What Hi-Fi? It's a development of the original Duo-i, with new amplification circuitry and a revised electrical layout for 'Works with iPhone' certification. Standby power consumption has been "considerably reduced", claims Boston, and the unit is now available in gloss black and white finishes. Inside the cabinet are two 3.5in Boston Acoustics drive units and BassTrac processing is used to deliver "clean, full bass at all levels". The dock's display dims to match a room's ambient lighting levels, there are dual alarm clocks, an FM radio and the entire front aluminium trim is a touch-sensitive snooze bar. Completing the package are front-mounted 3.5mm sockets for MP3 in and headphone out, rear RCA phono inputs and outputs, a composite video output and remote control. What's more, you can personalise your Duo-i by adding one of four differently coloured speaker grilles, available as an option: Glacier Light Blue, Chili Pepper Red, Rose Bud Pink and Spanish Moss Light Green.